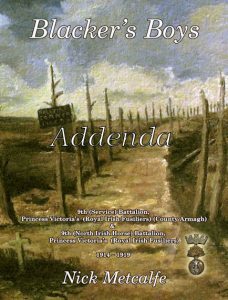 Here you will find updates and amendments to Blacker’s Boys based on contributions since publication of the book in November 2012, and additional material about Princess Victoria’s (Royal Irish Fusiliers) in the First World War. Clicking on the images below will take you to the relevant content. 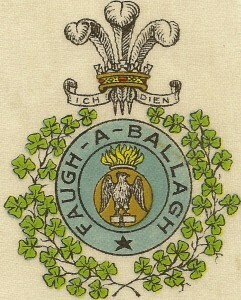 If you have any information that you wish to contribute about the Battalion or the men who served in it, please contact me via the ‘About’ page above. The contents of these pages are not to be reproduced without permission. Since the book’s publication, I have received a wealth of new information and photographs which have been compiled into an addendum in the same format as the book. The pdf may be downloaded from the book’s website. 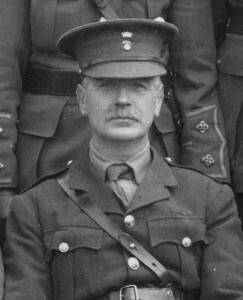 While in command of the 9th Royal Irish Fusiliers, Lieutenant Colonel Stewart Blacker wrote to his wife almost every day. The letters provide a fascinating insight life in the front line. They will be published 100 years after they were first written—the first letter was published on 3 October 2015 and the last letter on 13 March 2017. This study explains how each battalion of the Regiment evolved throughout the war years. It is divided into six parts, and I hope it will help others with their research and their understanding of the make-up of the Regiment during the First World War. 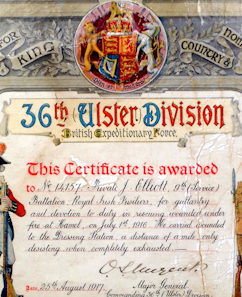 A study of the various certificates that recognised brave conduct brought to the notice of the commanders of the three divisions raised in Ireland during the First World War.